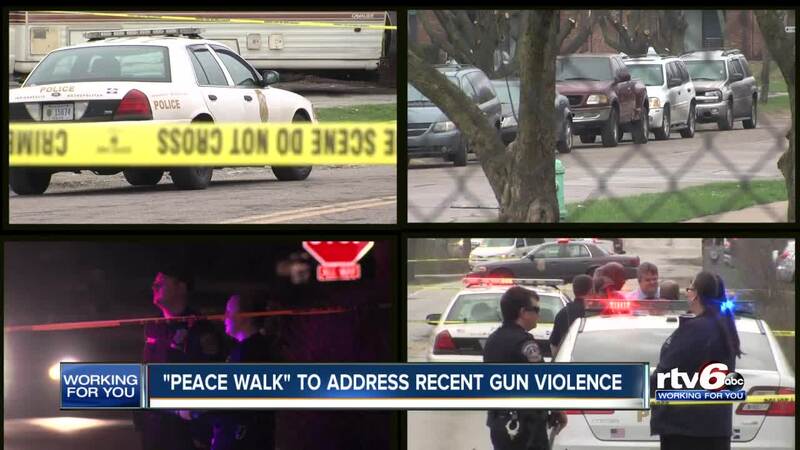 Indy Peace Walk to address recent gun violence. INDIANAPOLIS — Reverend Charles Harrison and his Indy TenPoint Coalition will join the police, community members and faith leaders at a peace walk on Friday night. "Everybody in the city is just really frustrated with the level of violence that we have seen in this city," Rev. Harrison, Board President of Indy TenPoint Coalition, said. Community leaders are offering planned the event as part of an effort to change the way people approach conflict. "Get the community more engaged and more involved so that together - with law enforcement - we can begin to do things that would reduce the level of violence we're seeing in this city, on all sides of town," Rev. Harrison said. From College Avenue to Franklin Road, shootings started Saturday night and continued through the morning with the last gunfire happening 24 hours later Sunday night. Eleven people were shot, six of them killed. Rev. Harrison says it's time for the conversation to find better ways to arm people, not with guns, but with the tools to de-escalate conflicts. "People are now settling their conflicts, their interpersonal conflicts, with violence," Rev. Harrison said. "As a society, we really have to talk about what do we need to do as a larger society to get people to start settling their conflicts in peaceful, nonviolent ways." Settling conflicts with peaceful, nonviolent techniques are part of the TenPoint Coalitions' boots-on-the-ground strategy to end violence. "We have to talk about why people no longer respect the sanctity of human life, and what has lead to that, and how do we get our arms around it now, so we have less people being killed because of that," Rev. Harrison said. The Indy Peace Walk will begin at 7 p.m. at the intersection of 34th Street and Keystone Avenue on Friday, April 12. Fraternal Order of Police, Lodge 86, President Rick Snyder, asks residents, business owners and members of various Indianapolis communities to join the walk. If you have a problem and need help getting results, connect with RTV6 by emailing us at workingforyou@rtv6.com or filling out the form below.